were added to the list. who were omitted from the original numbered list by mistake. (Eagle 1964 from Troop 28, Spartanburg, SC. 1 Reverend O. L. Evans was ?Director of Boys Work? in Americus from 1934 until the opening of Chehaw Council in 1939. After 1939 he was the District Commissioner until his health failed in about 1945. He often took over as the temporary scoutmaster when a troop was without one. He served as scoutmaster for Troop 1 (now Troop 21) from early 1936 until late 1937 so he has been listed as a scoutmaster. 2 John Pope served as Scoutmaster for 6 months while Charlie Hogg was in the Military during World War II. 3. J. A. Lutz was the "Scoutmaster" of the cub scout "troop" associated with Troop 21 during this time period. At this time Cub Masters were called "Scoutmasters" and Cub Packs were called "Troops." 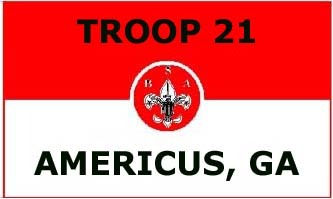 This probably is the source of some sources listing him as a Troop 21 Scoutmaster..